Planning is one of the most important aspects of managing any business. This is especially true for farms and agribusinesses due to their complexity and the inherent uncertainties (i.e., weather, commodity prices) associated with agriculture. It is essential that farm managers take time to adequately plan for all facets of their business. Farm families are encouraged to adopt a whole farm planning approach as they develop strategies for the future success of their business. 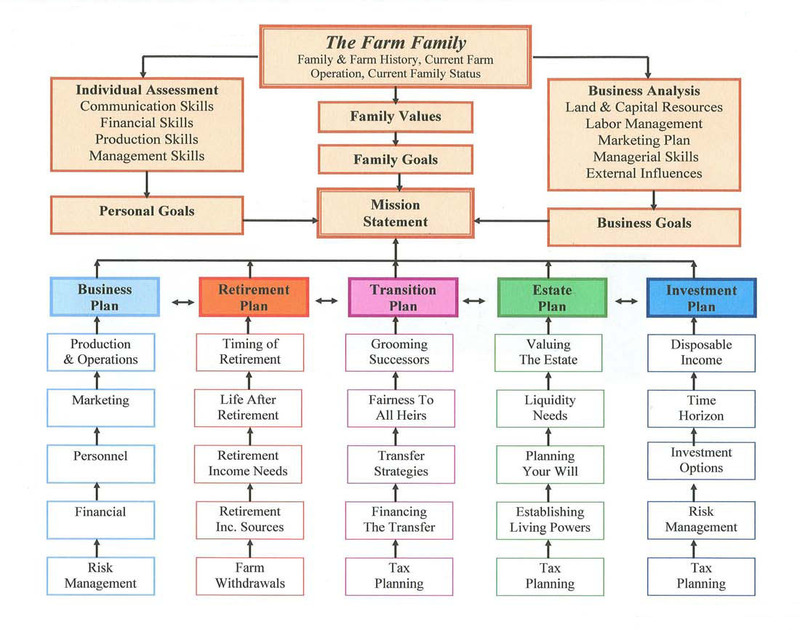 This approach allows families to examine the internal structure of their business and then develop business, retirement, transition, estate and investment plans. At the center of most farms and agricultural businesses is the family unit. Each family, individually and collectively, has its own history, values, and goals. It is valuable for the business to begin the planning process by reflecting on family and farm history. Valuable lessons can be learned by all the generations involved by examining past successes and disappointments. The underlying values and goals of the family unit should also be determined. While these values and goals oftentimes remain unspoken, they have a large impact on how family members treat each other and employees and make business decisions. A critical look should also be given to understanding the effect that family members could have on the farm operation, especially those (spouses, in-laws, cousins, ex-spouses) who are not directly involved in the day-to-day operations. There is no one test that can identify individuals suited for a career in agriculture. Each member of the farm business should conduct a self-assessment of his or her communication, financial, production, marketing and management skills. There are a multitude of skills that each individual can bring to an operation. This is beneficial given the complexity of most farming operations. While some family members may be better with bookkeeping or managing employees, others may be better at managing livestock or fixing equipment. What goals do I have for our farm? How do my personal goals and dreams agree with or conflict with the business goals? What strengths and weaknesses do I have in regard to managing the enterprises raised or produced by the farm (crops, livestock, manure, agricultural service)? How are my decision-making skills? What are my budgeting and financial skills? What are my marketing skills? What is my personality type, and how does it blend with family members or employees? What are the financial needs of my family? How does my family feel about the business? There are many individual assessments available for use by farm operations. Contact your local Extension office for examples of these assessments. An analysis of the current state of the farm should be conducted to determine the available land, labor, capital and management resources. This process looks at the who, what, where, and why of the business. Who works on the farm? What does the farm grow or raise? Where does it produce its commodities? Why does the farm exist? This analysis should determine the physical, fiscal and personnel status of the business. This analysis should also examine the operation's efficiency and identify any available resources that are not currently being utilized. The farm's profitability, business structure, operating procedures and employee management should also be determined. It is also helpful for the management team to identify the external influences that could impact the business in the future. These influences could include any governmental, political, economical, environmental, social or technological elements. After taking a snapshot of where the farm business is currently, the family business team should develop key goals for the future. It is important that each individual share his or her individual goals and skill-set assessments with the other members of the business during this process. Members can then work together to determine the responsibilities of each and to develop goals. Successful farm businesses are ones whose goals and objectives are a reflection of all the members involved in the operation. Once the family, individual and business analyses have been completed, the management team should develop a mission statement for the farm. A mission statement is a short statement describing the fundamental reason for the business to exist — its critical purpose. This statement aligns what the business says it does, what it actually does, and what others believe it is about. This statement is a reflection of the underlying values, goals, and purposes of the family business. "The purpose of the Buxton Fruit Farm is to produce and market high-quality apples and table grapes in sufficient quantity to provide a good standard of living for my family and full-time employees. We believe the farm is a good environment for raising children and desire to have the farm remain economically viable for future generations." For more information on developing mission statements, refer to the OSU Extension fact sheet Develop a Useful Mission Statement for Your Agricultural Business. Once a family has completed its internal analysis, family members can continue the planning process by developing business, retirement, transition, estate, and investment plans. A description of each planning area is given in the following paragraphs. It should be noted that each of these planning areas does not stand alone. Like spokes in a wheel, all will need to work in harmony to ensure the long-term viability of the business. Each area can positively or negatively affect the performance of the others. One example of this would be if investment planning has gone well, more assets will be available to help fund business operations or retirement needs. As plans are developed for each of the five areas, it is essential that the management team examine the effects that each has or could potentially have on the other plans. A business must be profitable in the long run in order to exist. On most farms, the major planning that occurs is for the farm's production practices. An example of this is deciding what variety of corn to plant or deciding what sires to use for breeding cows. However, planning for the success of the farm business should include much more. A comprehensive business plan should be developed. This plan not only helps the family develop a plan of action for production and operation practices, but also helps develop plans for the financial, marketing, personnel and risk-management sectors of the business. One recommended method of evaluating the farm business is to conduct a SWOT analysis. This analysis examines the Strengths, Weaknesses, Opportunities and Threats in each of these areas. For information on how to conduct a SWOT analysis, refer to the OSU Extension fact sheet Conducting a SWOT Analysis of Your Agricultural Business. In short, the agricultural business plan presents a picture of the agricultural business or farm, where the business is going, and how it will get there. No one expects to work forever. A strategy to help each business member meet his or her expected retirement needs should be developed. The two main retirement questions that should be addressed are how much money does each family member need for retirement and what will the farm's obligation be to retirees? A variety of factors such as age at retirement, retirement housing and other retirement accounts held by the family will affect retirement needs. It is essential that retirement plans are established early for all members of the business. It is also important that the profitability of the farm be such that a family member can retire and not adversely affect the financial position of the business. The goal of transition planning is to ensure that the business has the resources to continue for many generations. Transition planning helps the family analyze its current situation, examine the future, and then develop a plan to transfer the business to the next generation. This includes planning not only for the transfer of assets but also managerial control. Members of the primary generation should invest time in transferring their knowledge to the next generation. For more information on transferring the family business to the next generation, refer to the OSU Extension fact sheet Planning for the Successful Transition of Your Agricultural Business. Other discussions should center on when the next generation is authorized to make capital purchases and when that generation will take over control of activities such as paying bills and keeping production or compliance records. The transition plan, coupled with the estate plan, should also address how off-farm heirs will be treated through the transfer process without jeopardizing the future of the farm or the agricultural business. Farm estate planning is determining how the farm assets, such as land, buildings, livestock, crops, investments, machinery, feed, savings, life insurance, personal possessions, and debts owed to or by the farm, will be distributed upon the death of the principal operator(s). Due to the potential tax implications of transferring these assets, consultation should be made with an attorney and a tax practitioner, each having experience in transition planning. The primary investments made by farm families are usually in land, machinery, and livestock. Farm operations may, however, wish to invest in such off-farm investments as stocks, bonds, mutual funds, real estate, life insurance, retirement homes, precious metals or disability insurance. These investments allow farmers to save for future education or retirement needs and allow for investment diversification. Factors that farmers will need to consider during investment planning include the rate of return, personal risk tolerance levels, tax considerations and the time horizon available for investing. Planning for the future is one of the most important functions of management. By implementing a whole farm approach to planning, farm businesses can be ready to face the future with confidence. A multitude of resources are available through Ohio State University Extension offices to help farm operations plan for the future. Contact your local Extension office for more specifics in any of these planning areas. Erven, B., Anderson, L., Brockett, B., Gibbons, G., and Polson, J. 1995. Management Excel Training Manual. Ohio State University Extension. Marrison, David. 2007. Planning for the Successful Transition of Your Agricultural Business. Ohio State University Extension Fact Sheet. This fact sheet was developed as a result of a grant received by Ohio State University Extension from the North Central Risk Management Education Center, 2006-2007. It was reviewed in 2016.